We had two more snowy days this weekend. Are you noticing a theme to the blog these days? The first snow happened Friday night into Saturday morning. Thankfully the snow stopped around 9am so I could get to a Bridal Shower without a problem later in the day! The second snow storm went from mid-day Sunday through mid to late morning on Monday. The storm was bad enough for work to be closed again and this was a big relief to me, as the roads had been horrible as I went to the grocery store on Sunday. During this snow storm I was prepared with some really good food to cook! It was my first time ever making Chicken Cacciatore. I was visiting my mom on this weekend and we ventured out to Whole Foods on Sunday to pick up the ingredients that we needed. Thankfully we had a list of items that we needed, and because we were really just shopping for one meal it was not an overwhelming trip. However, the weather was quickly deteriorating as we were inside picking up bunches of parsley and chicken breasts! I was so thankful when we finally got home and I put the groceries away. We were officially going to ride out the latest storm inside, so we turned on the fireplace and made cups of tea. As it got closer to dinner time, I got myself into the kitchen to get started. I was really excited to be making Chicken Cacciatore for the first time ever. I had researched the meal by looking up several recipes and studying them. 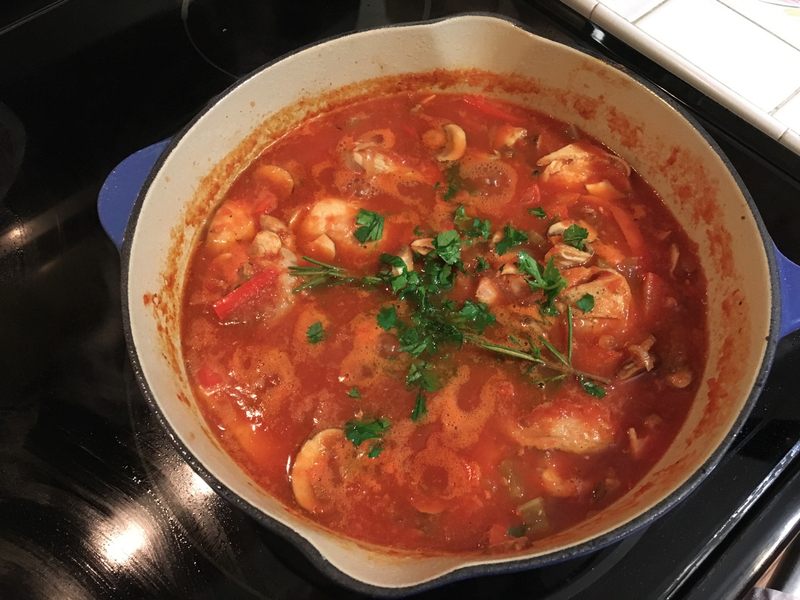 One of the things I love about Chicken Cacciatore is that there are so many different ways to go about it. 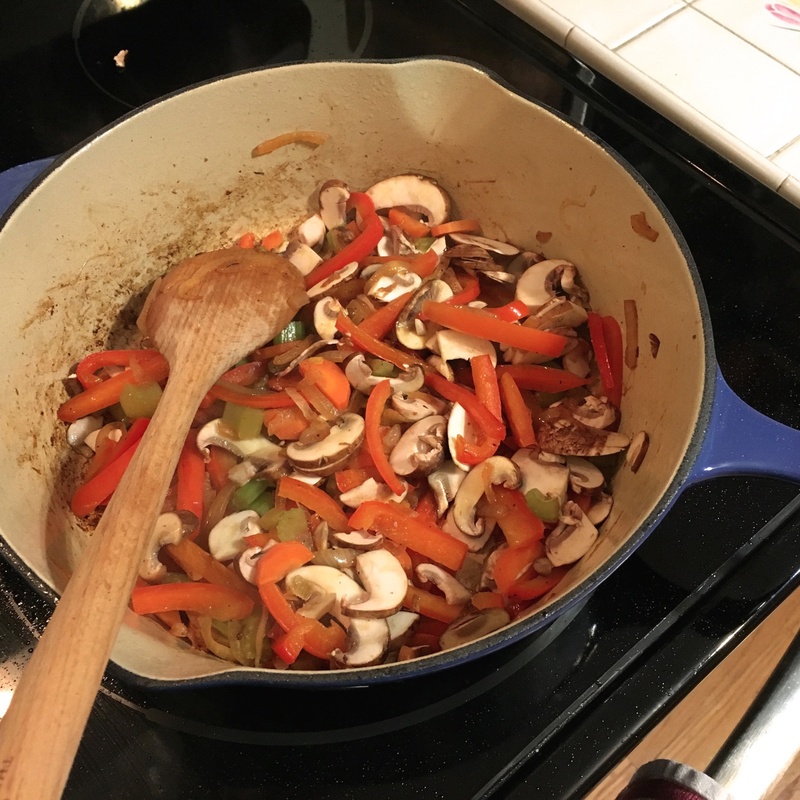 Before touching the chicken (I still can’t stand touching raw meat) I chopped up all of my vegetables – an onion, a carrot, a red pepper, two celery stalks, ten medium mushrooms (thinly sliced) and parsley. I love how many vegetables go into this meal. Once I had chopped up all of the vegetables I needed, I took out my chicken breasts and cut them in half vertically. There were two pieces that were pretty thick, so I cut them in half horizontally. I sprinkled both sides of the chicken breasts with sea salt and freshly ground pepper and heated up one tablespoon of olive oil over medium high heat. 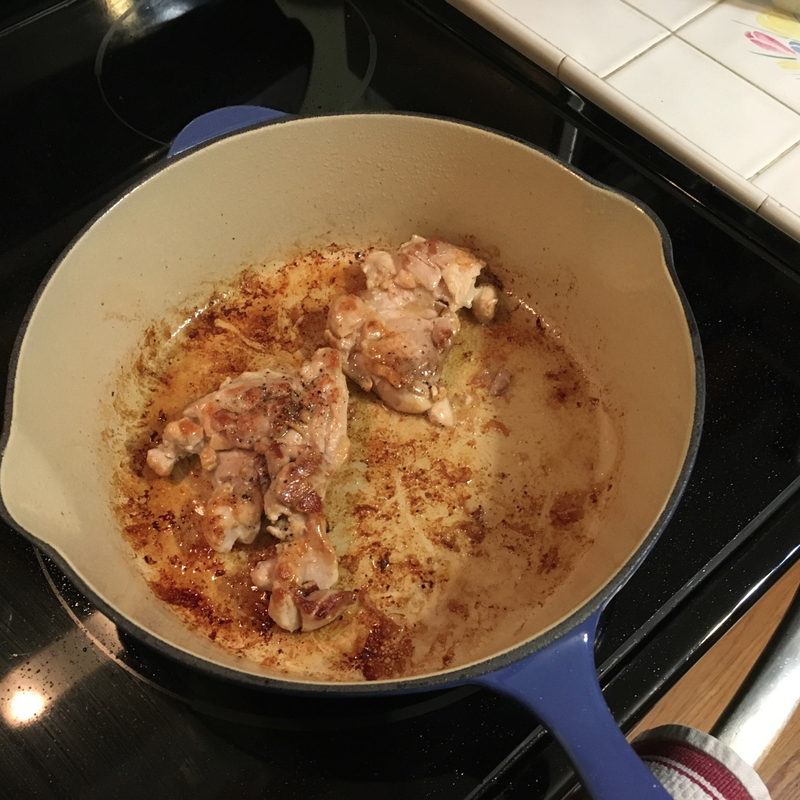 Once the oil was hot, I placed the pieces of chicken breasts into my high sided pan. As the breasts cooked, I took out my two chicken thighs and seasoned them with salt and pepper. Once the breasts were cooked, I took them out and placed them on a platter, added a little more olive oil and cooked the thighs. The kitchen was smelling really good as I cooked the chicken. Once the thighs were cooked I put the vegetables in the same pot and deglazed with a little bit of white wine. Talk about a delicious smell! As the veggies continued to cook, I deglazed a little more with maybe 1/4 cup of water. The veggies continued to cook while I got out my Vitamix to pulse the can of whole tomatoes. Let me tell you, this is something I have not done too much of in the past – but I will be doing it from now on. This simple step made a delicious sauce and base for this entire dish. It was bright and seemed so fresh – I loved it. It was worth getting out the Vitamix and doing the (easy) clean up after. I like using whole tomatoes now more than diced or crushed tomatoes in the can. I placed a sprig of rosemary and sprinkled parsley on top, turned the heat down to low and let it simmer for 30 minutes stirring occasionally. I had bought fresh pasta from Whole Foods to serve with the cacciatore, so while the simmering continued I got a large pot of water on the stove and brought it to a boil (this seemed to take such a long time!) Once the water was boiling I added a pinch of salt and added the fresh pasta. It was ready in about 3 1/2 minutes. 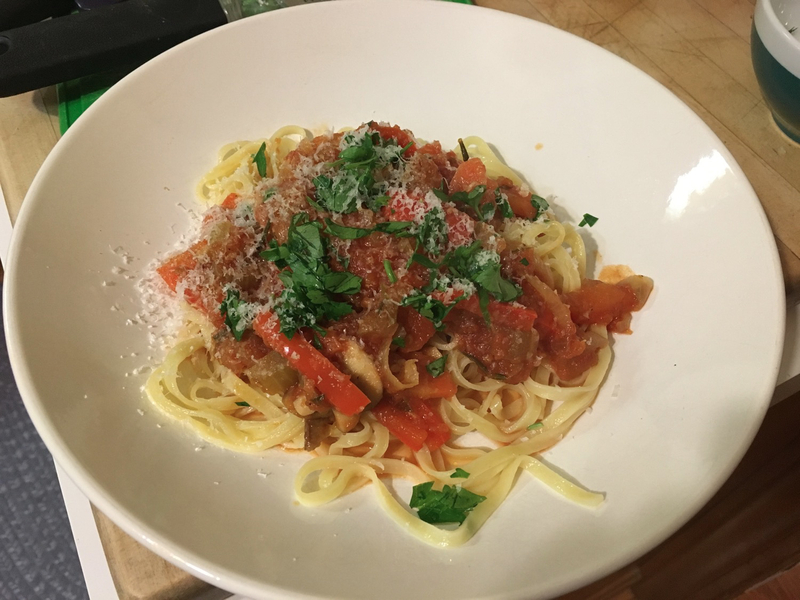 (I love fresh pasta – but don’t over cook it!) I drained the pasta, added it back into the pot I cooked it in and added a drizzle of olive oil so it didn’t stick together. And just like that dinner was served! This recipe was surprisingly easy and it was worth every moment. I love that most of the cooking takes place in one high sided pan. I also love how many fresh vegetables go into this dish. If you haven’t tried cacciatore before – definitely make it, it might become one of your new favorite meals! Pasta, parsley and freshly grated parmesan for serving. Cut the chicken breasts in half and if they are thick, slice them once lengthwise. Heat olive oil in high sided pan (or dutch oven). Salt and pepper chicken breasts and chicken thighs. Cook chicken in batches, approximately 6 minutes per side. As chicken finishes cooking, remove from pot and place on platter. Continue until chicken is cooked. Add red pepper, onion, carrots and celery to pot and sautée for several minutes. Deglaze pan with some of the white wine. After the veggies are tender, add the sliced mushrooms. In a food processor or blender purée the whole tomatoes. Add them to the pan. Bring the contents of pan to a simmer. Add the chicken back into the pan, add two tablespoons of chopped parsley, ½ teaspoon of both garlic powder and red pepper flakes, and a sprig of rosemary. Cook for 30 minutes on low, at a low simmer. Serve with a pasta. Garnish with parsley and freshly grated parmesan.